Phillips Clinic Family Practice (Las Vegas) - Book Appointment Online! 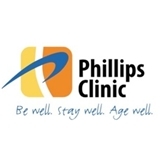 Welcome to Phillips Clinic Phillips Clinic is a family practice and general medical office with a strong emphasis on health, wellness, and anti-aging medicine, located in Las Vegas, Nevada. Phillips Clinic offers both traditional and complementary medicine, along with vital immunizations such as tetanus shots, Pneumococcal vaccinations and flu shots, and minor surgical procedures when necessary. In addition to managing your acute or chronic illnesses, we also offer: Wellness exams • Pediatrics • Sports physicals • DOT Physicals • Gynecological exams • Bio-identical hormone therapy • Individual compound prescriptions • Aesthetic procedures • On Site Radiology • Bone Density Scans • On Site Ultrasound • Body Fat Analysis • Weight Loss Program Our goal is for our patients to be well and stay well.